Home Asia Singapore WTH Grassroots Leader Sentenced to 10-Months Jail And 3 Strokes Of The Cane - Does The Punishment Fit The Crime? Grassroots Leader Sentenced to 10-Months Jail And 3 Strokes Of The Cane - Does The Punishment Fit The Crime? Now I'm not saying that the behaviour of Lee Song Koi is acceptable by any means, but I do question the sentence handed down yesterday by a District Judge. 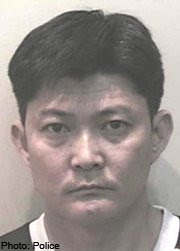 Lee was charged and convicted for molesting his Indonesian Maid in an incident that occurred on July 7th last year. Lee who is 46-years-old, is the secretary of the Punggol Angsana Residents' Committee, and has been a grassroots volunteer for 10 years. He works as an incineration plant supervisor at the National Environment Agency (NEA), and is married with two teenage children (15 and 17). He also suffers from a congenital heart disease. According to testimony given through trial, Lee returned home on July 7th after attending a company function where he had consumed a 'few drinks'. He entered the maid's bedroom (where she was sleeping) and forced himself on her. He then lifted her T-shirt and bra above her shoulders, lay on top of her and kissed her on the lips, neck and breasts, even though the maid pleaded for him to stop. After the incident, he told her not to tell anyone before leaving the room. This is Lee's first offence, and has had at least five different maids during the last 17 years, all employed without incident. The 21-year-old victim in this case had just completed a two year contract with Lee's family and had asked for an extension of contract. Taking this into account, although it is impossible to discount his behaviour and actions, and also bearing in mind how demeaning and scary it must have been for his maid, I really think that 10-months imprisonment and 3 strokes of the cane is a very tough sentence. I'm guessing that the following actions three days after the incident occurred, were perhaps the mitigating circumstances that led the judge to his sentencing decision. Two other charges of hugging the victim the same day were taken into consideration. As the 'employer' of the maid, Lee cancelled the maid's work permit and attempted to send her home to Indonesia. Lee's wife (who works as a sales administrator) was taking the maid to Terminal 3 of Changi airport, when they were intercepted by police, after a frantic 999 call was received from the maid's cousin. Friends and family of Lee (including his wife and children) submitted letters to the court pleading for leniency. His wife wrote that she and Lee had been happily married for 19 years, and they had employed the maid to care for her late mother. She added that Lee is needed by his family for financial reasons. The maximum sentence that Lee could have received for his crime, is three years imprisonment and/or caning. Did he get off lightly at only 10-months incarceration? He is appealing against his sentence and has been granted bail of $15,000. He has reportedly also paid $5,000 as compensation to the victim. Pete, u r right..the punishment doesn't fit the crime. It should have been 36 months and 24 strokes of the cane. Hi Gary - hope the trip 'down under' is going well... when do you get back home? As well as the maid, I actually feel very sorry for his family - sounds like finanically they've got no option but to stand behind him (for financial reasons), but must be so embarrassing for his wife.